With the opening of Smiling Creek Elementary in September 2018, SD43 has announced that a catchment area for the school will be defined and are inviting you to a meeting. As well, registration information on transferring schools or remaining in your child’s current school will also be shared at that meeting. According to SD43, students will have the option to be grandfathered in their current elementary school, regardless of their address, if they wish to stay. Attendees will have the opportunity to provide written feedback. Feedback will be reviewed and final decisions will be communicated out in early January. The November 30th meeting is an Information Session only. The registration and transfer process will occur in January. 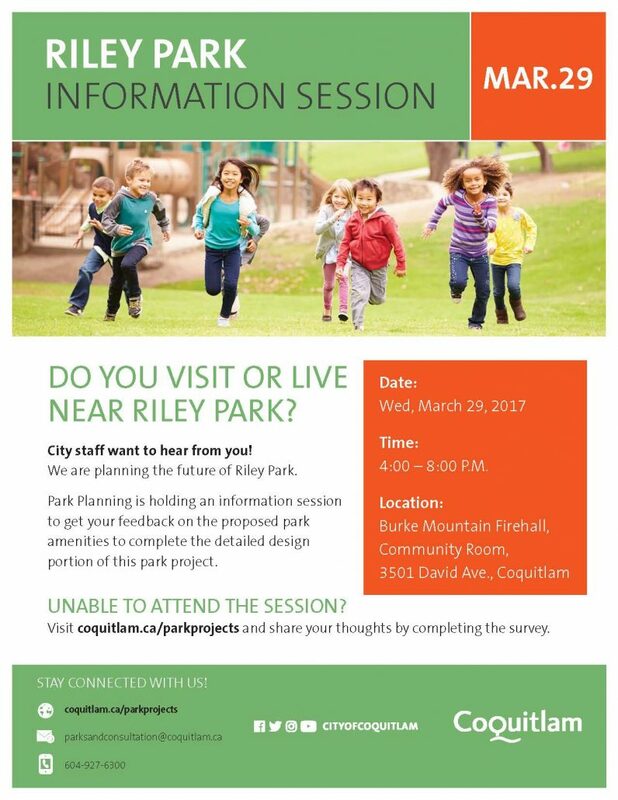 The City of Coquitlam is hosting on information session on the future development of Riley Park on Burke Mountain. Burke Mountain residents and park neighbours are invited by the City of Coquitlam to provide feedback on the future development of Riley Park – either in person or via an online survey. Information Session attendees will have the opportunity to view display boards that illustrate the park development, ask questions of Coquitlam staff and provide feedback on the proposed park amenities. Area residents may also be interested to know that, because Riley Park is located within 700 m walking distance of Sheffield Park, a 2 acre site near the intersection of Chandler St. and Sheffield Ave., planning for both parks is being coordinated to ensure a wide range of recreation options. Sheffield Park planning is scheduled for fall 2017/winter 2018. Those unable to attend the Information Session or seeking additional information are encouraged to visit www.coquitlam.ca/parkprojects after March 29 to view the display materials and to provide their feedback via an online survey which will be open until April 12. The City of Coquitlamn is accepting feedback on the Partington Creek Neighbourhood Centre. This is the future commercial and social hub of Burke Mountain! Part 1: Partington Creek Neighbourhood Centre Concept Plan- which summarizes the principles, site design concept, land uses and supporting design ideas for how the Neighborhood Centre can be developed. Part 3: Partington Creek Neighbourhod Centre Development Permit Guidelines- which identifies the desired form and character of commercial and residential development in the Neighbourhood Centre. In person at City Hall, 3000 Guildford Way at the City Clerk’s Office during the hours of 8:00 a.m. to 5:00 p.m. from Wednesday, March 15, 2017 to Thursday, March 23 2017 excluding statutory holidays. Visit the Planning and Development Department at City Hall (3000 Guildford Way, Coquitlam, BC) during the hours of 8:00 a.m. to 5:00 p.m. from Monday to Friday excluding statutory holidays. Below is the City of Coquitlam’s ad from the Tri-City News. All residents of Burke Mountain are invited to attend the Northeast Coquitlam Ratepayers Monthly Meeting. For more information, call 604.941.2260 or 604.942.9725. The Northeast Coquitlam Ratepayer’s Association is a local, community based group that looks out for the interests of the populace of the Northeast Coquitlam and Burke Mountain areas. They meet the third Thursday of every month at 7:00pm at Victoria Hall. A team from BC Assessment will be attending the Northeast Coquitlam Ratepayer’s Association meeting this month. All residents of Burke Mountain are invited to attend, ask questions, and hear from the BC Assessment Team. Please bring a non-perishable food item for SHARE’s food bank – this is an annual collection the NECRA does every January to help support the food bank through the winter. The City of Coquitlam will be holding two Community Information Sessions in June 2016 on the Northwest Burke Vision. These two events allow you and your neighbours an opportunity to review the land use, access and servicing work completed to date, and to share your thoughts and ideas on the overall vision for the area. Download the City of Coquitlam’s Information Flyer Here. 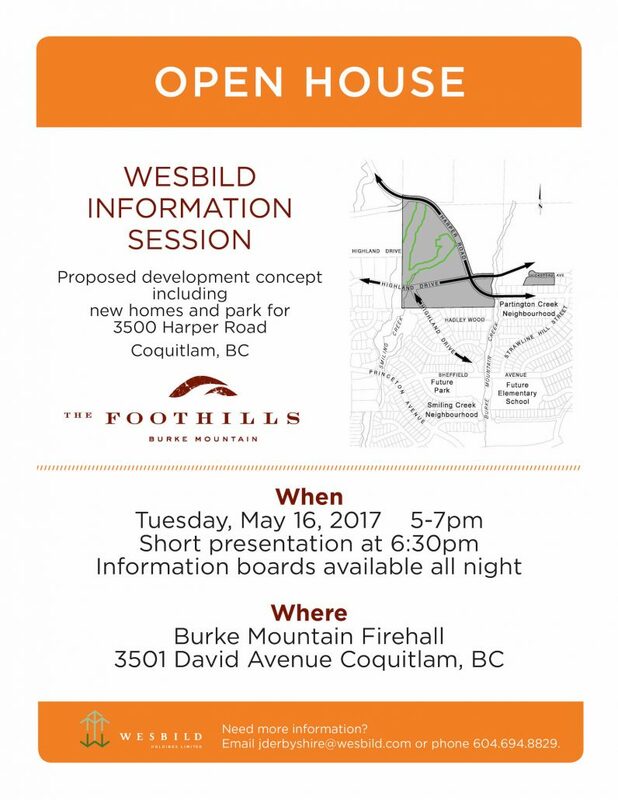 On Wednesday, May 4, Wesbild hosted a Community Information Session to review our proposed development concept including homes and park for 3000 Highland Drive ~ Coquitlam, BC. Thank you to all who attended and took the time to learn more about our proposal. Below is a link to the Information Boards we presented at the meeting including details on a brand new park which is estimated to open in Spring 2018!